Performance is critical in game development. 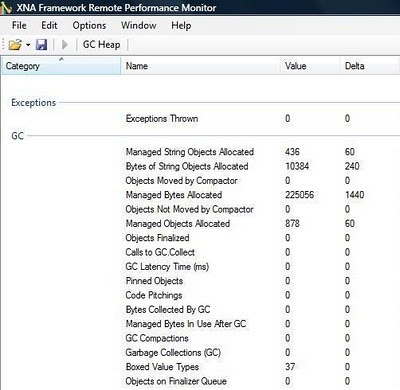 In XNA, game performance will degrade if you allow garbage to be generated during game play. On Xbox 360, generating too much garbage will force full garbage collection. If garbage collection takes longer than 1/60th of a second then the game will drop frames, and the more frequently full garbage collection occurs, the more frequently the game will drop frames. 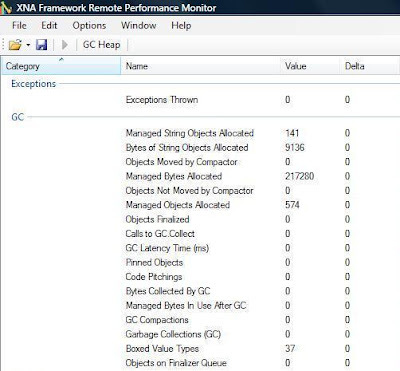 Here is a quick tutorial on how to use the XNA Framework Remote Performance Monitor if you have never used the tool before. There is a large source of information available on the Internet, in the form of blog posts, audio casts, articles and white papers that gives detailed analysis on all the statistics generated from the Remote Performance Monitor; from Pinned Objects to Platform Invoke Calls. This ensures game code does not unnecessarily generate garbage, force full collections and drop frames. Each scenario reveals game code that consistently generates too much garbage, impacts performance and has the potential to drop frames. However, there is no reason for game code to execute score.ToString() unconditionally every single frame. In the next post, we will continue this discussion on the Remote Performance Monitor with unnecessary boxed value types.